Quilt #5: "The Way Of A Pilgrim"
3.31.2014. 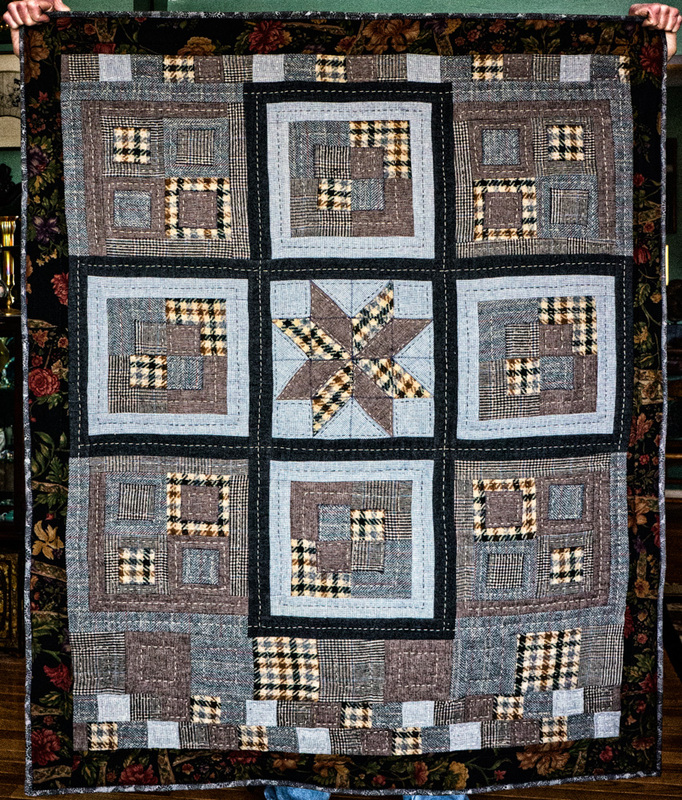 [Cont'd from 2 Mar 2014] Quilt No. 5 is finished. I've been referring to is as my "woolly Russia" quilt because (aside from actually being made from upcycled wool) its mood is dark and wintry. We made it during the Winter Olympic Games in Russia. We did our initial piecing to the music of Russian composers: Tchaikovsky, Rachmaninoff, Borodin, Rismky-Korsakov. And I started listening to an audio of "Brothers Karamazov" while at the sewing machine. So... Russia. I decided to call it "The Way Of A Pilgrim," after a 19th-century Russian work by the same name. The design started out to be traditional but the difficulty of working with the wool introduced quite a bit of improvisation. In the end, a cross emerged as the main design element. 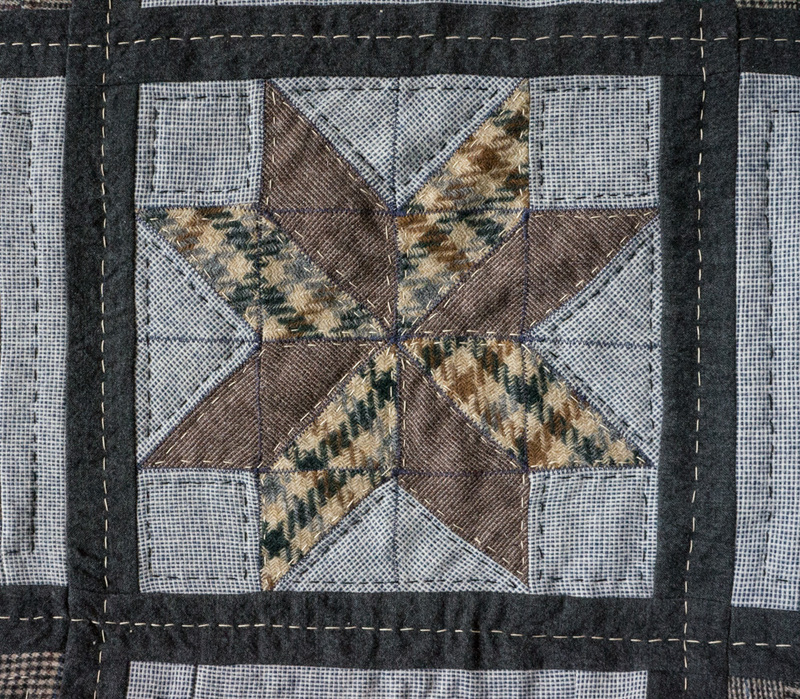 The pale hand-quilting on the dark sashing fabric makes the cross look like a road. And I love the idea of pilgrimage -- "a journey undertaken in the light of a story. "* I'm always sending myself on pilgrimages, if only in my mind. And I did actually read "The Way Of A Pilgrim" several years ago. It's a book about prayer, managing to be both conservative and radical at the same time. Like the mendicant pilgrim of the Russian story, my journey into quilting and other textile arts takes me deeper and deeper, so that I am moving from head (following instructions on a craft project) to heart (coming into a power I don't yet understand). The quilt is lap size. Jim sat at the machine and pieced the blocks inside the cross. I did the rest. We took utmost care, but it still pleasantly off-kilter, as is the big stitch hand-quilting. (The photo above may be a bit off-kilter as well.) We prefer to think of this as its vibrance, not its flaw. The backing and binding are cotton. *Definition of pilgrimage by author Paul Elie.